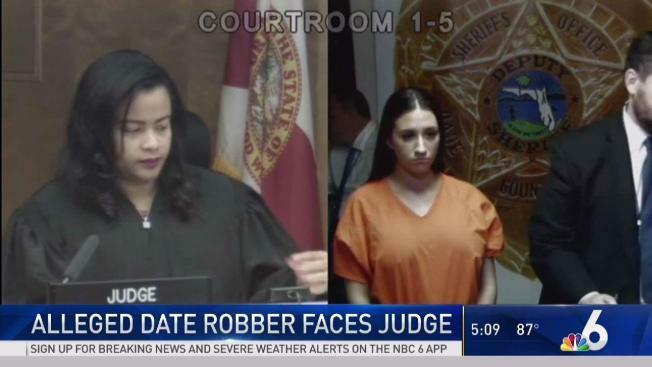 A woman accused of drugging and stealing an expensive watch, credit cards and other items from a man she met at at South Beach hotel bar has been arrested, authorities said. Gina Marie Cody, 29, was arrested Sunday on charges of grand theft and obtaining goods valued at $300 or more in credit cards, an arrest report said. A woman accused of drugging and stealing an expensive watch, credit cards and other items from a man she met at at South Beach hotel bar has been arrested, authorities said. Gina Marie Cody, 29, was arrested Sunday on charges of grand theft and obtaining goods valued at $300 or more in credit cards, an arrest report said. The report said Cody met the man at the W Hotel on Collins Avenue and 22nd Street on Miami Beach. She and another woman went back to his room, and the man later said he felt dizzy and fell asleep, the report said. When the man woke up, the women were gone, along with his $50,000 Rolex watch, a chain with a diamond pendant, earrings, cash and 14 credit cards, prosecutors said. Cody and another woman allegedly went shopping at the Bal Harbour shops, spending more than $40,000 using the victim’s credit cards, prosecutors said. They were seen on the store’s surveillance cameras. The women also allegedly tried using some of the credit cards at ATMs. Cody is also facing charges of prostitution in a separate case. "As your honor is aware we've had a lot of these cases recently where men, sometimes tourists, go to, you know, take women back to their hotel rooms, have a drink, wake up and have their belongings go missing," prosecutor Nessa Eth said at a bond court hearing for Cody on Monday. Prosecutors were asking the judge to set a higher monetary bond than usual in the theft case due to the nature of the allegations. The judge set her bond at $30,000. Attorney information wasn't available.